While the origins of the infamous bacon weave aren’t fully known, what we do know is that it’s one of the most extreme bacon recipes ever. And it’s bound to be a winner for any bacon themed contest. Since moving to Chicago bacon in the 90’s, my friends and I have held a bacon themed party each year that we called Baconfest. Foolishly, we never trademarked that name or registered the domain name. And now, the Baconfest brand has been commercialized into an annual festival. Regardless, we still hold our bacon party each year, where the main event is a contest for the best bacon themed recipe. When thinking about my entry for the 2009 Baconfest, I remembered there was a viral article from the New York Times about something called the Bacon Explosion. 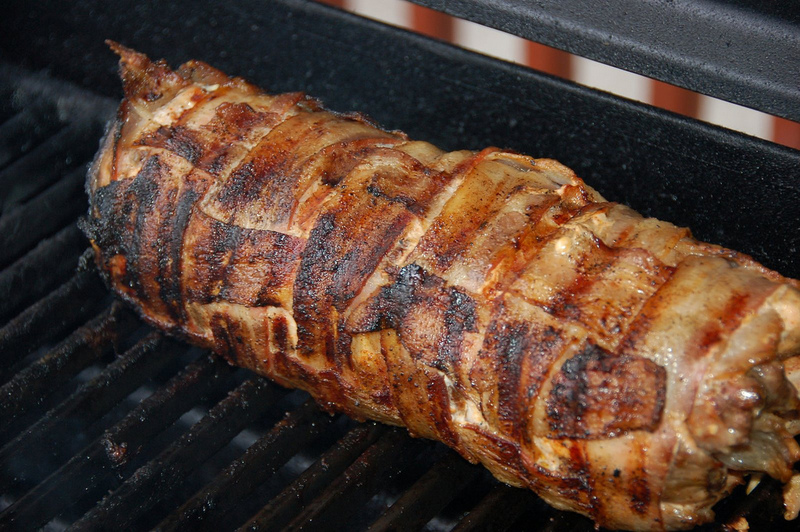 The Bacon explosion recipe is a layer of bacon with a mix other meats and rolled up in a tight weave. This definitely sounded like a winner. This proved to be a great way to grill bacon, smoke bacon and generally make bacon even more awesome. If you use a sweet rub on the exterior, you’re going to have something similar to candied bacon. My source in Chicago for all things meat related is Lincoln Quality Meat Market in Lincoln Square. While talking with John the Butcher about what would make this a winning entry, we landed on using a caseless sausage known as ćevapi or cevapcici for the filling. Cevapcici sausage is this awesome blend ground beef, pork, lamb and garlic that they make fresh in the shop. This transformed my bacon weave into this awesome bacon wrapped sausage roll. Making the Bacon Weave a contest winner would require more than just great meat, it would also need lots of smoke, as well as slow cooking due to the size. You’ll need about 20 thick slices of bacon to form the basic weave pattern. For thick sliced bacon, about 14 slices in a 7×7 weave is perfect. It all comes down to the size of your bacon and how big you want the final product to be. Start by weaving the bacon strips together to form the base. On top of the bacon add about 1/2 pound of sliced pork shoulder and about 2 tablespoons of BBQ rib rub. This is my recipe for a low sodium rib rub, since the bacon itself is already pretty salty. Next comes the secret ingredient. Spread the ćevapi (or any other ground meat you desire) on top of the pork shoulder. At this point you are ready to roll it up. The roll should be about 16 inches in length and tied off about every 2 inches to keep it from falling apart. Use about 9 pieces of butcher’s twine, 12 inches in length, and tightly tie up the entire bacon weave. To ensure that it sets nicely, I covered the pan and placed it in the refrigerator for 1 hour. Gas grills naturally are not great for smoking meat, but it is possible using a smoker box. Preheat your grill to get these smoking and level off the temperature to about 200 degrees. Carefully place the Bacon Weave on your grill and set it up for indirect cooking. Basically, turn off any burners that are beneath it. Cook the weave for about about 3 hours until it registers 165 degrees in the center of the roll. Right at the end, I cranked the grill up to maximum to crisp off the bacon and give it a nice smokey, glazed look. And yes, it won Baconfest that year!